I never thought that this sensational menu would caught me flat-face yesterday, I had a sour smile while sitting in a Chinese diner here in CdeO while trying to look something to fill my hunger. I have been supporting advocacy on no shark finning and signed petitions from groups and have been reading so much articles on marine protection and preservation. It was like a bomb reading shark fin in the menu right in front of me! It’s been months since I last visited this place but I never notice before fried shark fin and fin soup. I felt like throwing up! 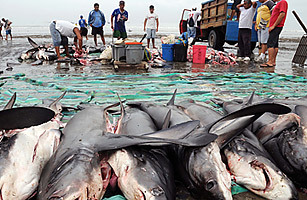 Dead sharks gathered at a beach in Ecuador! It pained me knowing that a number of shark died each year for such exotic and expensive dish. Statistics show that 126 species of shark out of 140 are threatened with extinction. All told, up to 70 million sharks are culled annually for the trade, despite the fact that 30% of shark species are currently endangered. Last month, California has signed into law the ban for shark finning, a victory over this anomalous slaughter of marine life. Other countries are still fighting for this advocacy though. But still the global shark population is suffering from this industry. I hope, firmly hope that this trade will also be banned in the Philippines soon. I wondered where they got their supply of shark meat, hopefully not in nearby waters in Mindanao. Anyhow, I just decided never to patronize this diner anymore. NB. Photos courtesy from Time magazine, online edition.